Marple Newtown High School is looking for two assistant football coach and an assistant 9th grade football coach. And contact Chris Gicking at cgicking@mnsd.org or 215 983 0752. Saucon Valley High School (District 11) is looking to hire a Skill Position coach for the upcoming season. This coach would be responsible for Wide Receivers on offense and either Corners or Safties on defense. There is possibly a Defensive Coordinator position available for the right candidate, We are also looking for a volunteer middle school assistant. Please send your resume to Head Coach Brad Trembler, coachtrembler@yahoo.com. Pottstown High School (PAC, District 1) is seeking qualified football coaches for the following positions. Anyone interested should contact Head Coach Jeff Delaney at jdelaney@pottstownk12.org. West Chester East High School (ChesMont, District 1) is seeking a qualified football coach for the 9thgrade team. This is a paid position. Any interested candidates can apply at https://www.wcasd.net/Page/647. In addition, please send resumes and references to Athletic Director, Sue Cornelius at scornelius@wcasd.net. Boys’ Latin of Philadelphia Charter High School seeks a head coach for the 2019 football season. All candidates should have a minimum of 5 years coaching at the high school or college level. Candidates should have all coaching clearances. Resumes should be sent to jdunn@boyslatin.org. West Catholic Preparatory High School – 2018 District Champions and State Semifinalists – in Philadelphia is seeking a Head Varsity Football Coach. The Head Coach is responsible for the complete oversight of the football program. Interested applicants should have relevant experience coaching at a highly competitive level. To build strong men – physically, mentally, and morally. To provide strong general supervision and guidance. To reflect the mission and philosophy of West Catholic in the football program. Proven ability to create a high performing, positive team culture where participants grow as students and athletes in a safe and enriching environment. 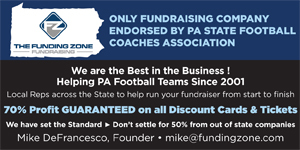 To lead pre-season, as well as off-season, conditioning and skill development activities in compliance with PIAA rules, regulations, and by-laws. Have exceptional organizational skills and be detailed with all components of the program. To be a strong communicator with players, with families, as well as with administrators and teachers to ensure the smooth running of the program. To oversee the selection and supervision of assistant coaches, to supervise their work, and to make suggestions on coach development and retention to the Athletic Director. All candidates must provide up to date required background checks and clearances including but not limited to PA Criminal Background Check, Child Abuse Clearance, FBI Fingerprint Clearance, and Archdiocesan Safe Environment Training once hired. Interested applicants should send resume and cover letter (email is preferred) to Director of Student Life and Athletics, Justin Bangs at jbangs@westcatholic.org. Columbia HS is seeking an experienced qualified varsity OL/DL coach. If interested contact Head Coach Bud Kyle at budkyle1@gmail.com. Northern Lehigh HS has a full-time Varsity position available. For either Linebackers or Secondary. Interested applicants should sent a letter of interest and resume to Head Coach Joe Tout at jtout@nlsd.org March 29 is the deadline. Northern Lehigh has a full-time paid position available in their middle school program. Experience is preferred. Send letter of interest and resume to Head Coach Joe Tout at jtout@nlsd.org. March 29th is the deadline. Interboro High School is seeking a qualified coaching candidate. Position on offensive/defensive side is flexible. Please contact steven.lennox@interborosd.org if interested. Widener University is looking for a part-time Defensive Line Coach. If interested contact Dan Connor at dconnor353@gmail.com. Wissahickon High School (5A, SOL- American): Is seeking an experienced qualified varsity QB coach. Must be available for off-season training (Spring and Summer). Position requires commitment to off-season training, practices as well as games. Please send resumes along with references when emailing back. Palmerton Area HS (District 11) is looking to hire a middle school head coach for the 2019 season. Please email Head Coach Chris Walkowiak at football@palmerton.org with your resume. Archbishop Wood High School is seeking an experienced varsity OL coach. If interested, please send your resume to kyleadkins22@gmail.com. Imhotep Charter High School is still accepting applications for our OL position but all of our Defensive positions have been filled. Please contact HC Nick Lincoln at coachlinc@gmail.com. The 2018 District 11 5A Champions East Stroudsburg South High School is seeking a varsity offensive line/defensive line coach for the 2019 season. This is a paid position. Prior coaching experience is required. Please email Head Coach Matt Walters at matthew-walters@esasd.net with your resume. Bishop Shanahan Has an open Freshmen Head Football Coach position and several assistant coaching positions as well. Coaching experience required and background checks will be conducted. Pay not guaranteed and to be discussed during interview process. Please submit resumes along with references when emailing back. Is looking for an Offensive & Defensive Line coach that has knowledge in multiple blocking scheme and flexible knowledge of defensive front techniques. Position requires commitment to practices as well as games, background checks(will be provided to the selected candidate) & previous coaching for those positions is recommended. Cheltenham High School is looking to hire a QB coach immediately. Coordinating is possible for the right candidate for the 2019 season. Cheltenham finished 8-4 in 2018 losing in the second round of the District 1 5A playoffs. Please send resumes, references, and any questions to Ryan Nase – Head Football Coach – rnase@cheltenham.org by February 12th. Pottstown High School is seeking a varsity football coach for the upcoming season. Previous high school coordinator experience required. Previous experience as a head high school football coach preferred. Act 34, 114, and 151 clearances required. Fleetwood High School is looking to hire an Offensive Coordinator with prior experience. Please contact Head Coach Sean Gaul at coachgaul@gmail.com. Bethlehem Catholic Football, 3x defending District Champions and State Semifinalists, is looking for qualified defensive back or linebacker coaching candidates. Please email football@becahi.org with resume. Lansdale Catholic High School is searching for the position of Head Varsity Football Coach. This position would be responsible for the complete oversight of the football program at the school. Interested applicants should send resume and cover letter (email is preferred) to Athletic Director Robert Nydick at Rnydick@lansdalecatholic.com. Methacton High School is looking to hire an assistant coach at the Varsity/JV level. The ideal candidate will have experience coaching OL/DL, but we welcome all applicants. This paid position has an additional stipend available if the candidate is qualified to help oversee our strength and conditioning program. Big Spring School District is seeking a Head Football for the 2019 season. Teaching positions are available to qualified candidates. Big Spring a member of the Mid-Penn Conference and is a 4A program. The Head coach must be a competent teacher of the fundamentals as well as the fine points of football and conditioning. To build strong men, morally, physically and mentally. To provide competent general supervision and guidance. To reflect the philosophy of the school in their program. Encourage and support athletes to participate in other sports. Ensure pre-season, as well as off-season, conditioning and skill development activities for an upcoming sport comply with PIAA rules, regulations, and by-laws. The selection and supervision of assistant coaches their specific duties, explain those duties, and supervise their work and make yearly suggestions to Athletic Director. Conduct a pre-season meeting for the athletes and parents of athletes trying out for that sport. Have individual post-season meetings with your athletes and parents. Be a great communicator and motivator of student athletes. To apply for this position or to seek further details regarding the specifics you will need to create an account and/or login by visiting the following website https://bigspringsd.tedk12.com/hire/index.aspx. Detailed instructions are attached for your reference as needed regarding the internal application process. Please contact Joe Sinkovich, Athletic Director, for any other questions. Contact information is listed above. Twin Valley Football is looking for a varsity WR and DB coach. This is a paid position. Please contact Head Coach Dean Owens at dowens@tvsd.info if interested. The Boyertown Area School District is seeking a motivated and experienced coach with experience with running backs or the secondary. Applicant should possess previous JV/Varsity experience. Interested applicants can send resume to Head Football Coach T.J. Miller at tmiller@boyertownasd.org. Upper Moreland HS in Willow Grove, PA is looking to add a Defensive Coordinator, Defensive Position Coach and or an Offensive Skill Position Coach. Candidates should have prior playing experience and or high school coaching experience. No teaching positions available with these positions. Hatboro-Horsham High School is seeking a varsity football coach for the upcoming season. Cheltenham High School is looking to hire multiple coaches for the 2019 season. Cheltenham finished 8-4 in 2018 losing in the second round of the District 1 5A playoffs. We are looking to hire an offensive skill coach, defensive skill coach, and an Offensive Line coach. We would like one of those hires to also fill the role of Special Teams coordinator. All applications must be done online > Click here. New Hope-Solebury HS, a 3A school in Upper Bucks County, is seeking a Strength & Conditioning Coach/Assistant JV/Varsity Coach. Candidates should have prior playing experience and at least 2 years of coaching experience. This is a paid position. Anyone interested should send letter of interest and resume to Head Football Coach-Jim DiTulio @ jditulio@nhsd.org. or call 215-499-8840. Application deadline is December 20, 2018. Start up date is Monday, January 7, 2019. Deadline for application is December 7, 2018. Employment will be contingent upon receipt of acceptable clearances.